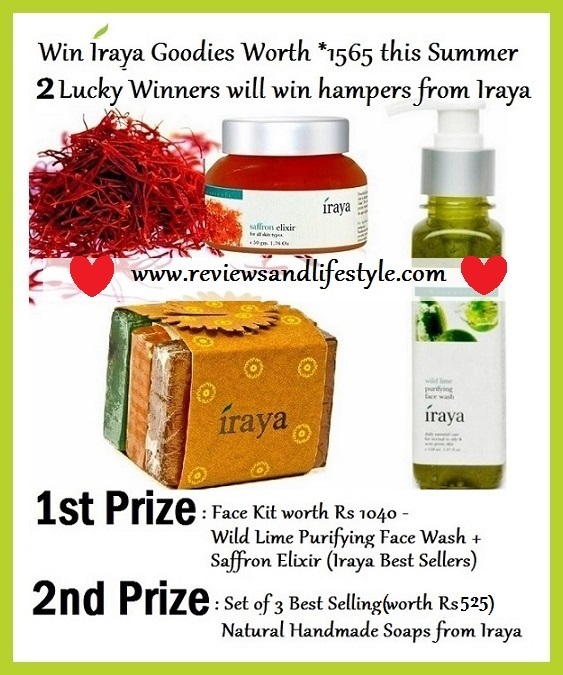 The famous Ayurvedic brand Iraya had sponsored some awesome goodies in our Summer Giveaway (see giveaway details HERE). I had posted the results on our Facebook page but almost forgot to share it here. Seema won a facial kit of Iraya's best selling Saffron Elixir and Wild Lime Purifying Face Wash worth Rs 1040. Jyotika won a set of 3 Natural hand made Iraya best selling soaps. Congratulations once again to both the winners. And they have already received their prizes too. You can see the pictures of Seema's prize here and Jyotika's prize here.